I knew, as soon as I arrived, that not many AUS members had come to the Lone Star Uke Fest in Dallas from Thurs, Apr 7 to Sat, Apr 9. So here’s my brief report for those who missed it. The #1 Good Thing about attending any uke fest is that if you are a uke fan, the fest gives you a chance to immerse yourself in uke for a few days. You enter the Holiday Inn in North Dallas, & there are uke folk everywhere. (Well, except for what appeared to be some kind of High School Prom Fashion Show going on at the same time in the hotel, which made for a few interesting situations.) Almost everyone not in a prom outfit is walking around with a uke, and you can compare instruments, have a chance to try lots of different instruments, and hear other players’ experiences with their instruments. And you can play together. Also, there are lots of classes and concerts; above left, for example, you’ll see “Ukulele Mike” Lynch demonstrating how to read tabulature. There are even classes presented on subjects only tangentially connected to ukuleles. On your right, you’ll see John Smith of the Wahooligans demonstrating how to build a percussive washboard. 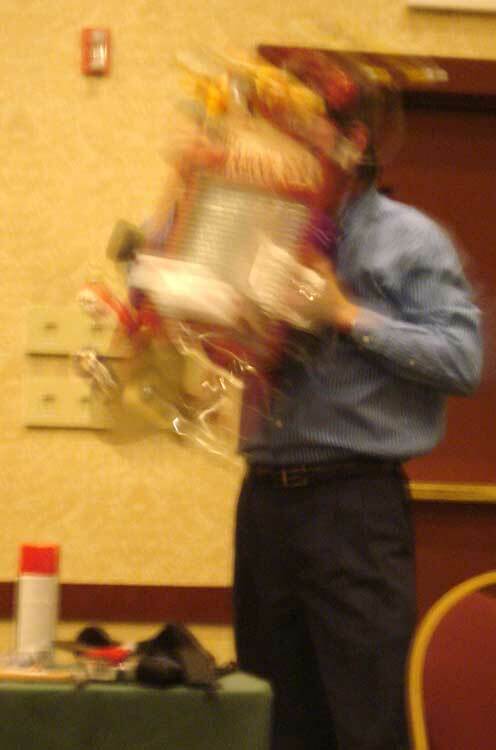 After telling us how difficult it is to even find a washboard in 2011, he showed us how to attach kazoos, bulb horns, and other miscellanea to the board, and create an attention-getting percussive instrument. 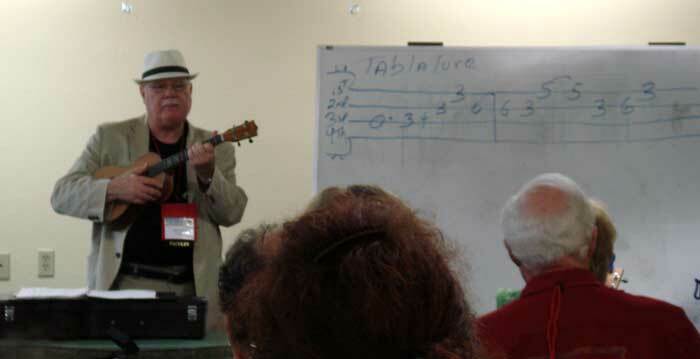 In other great classes, we learned the basics of fingerpicking from Mark “Spanky” Gutierrez of 4 Strings of Swing, and how to create a jazz chord solo from Gerald Ross, the uke and lap steel guitar player. You feel pushed past the flap of your envelope, which is good. Pops Bayless offered sessions on showmanship and playing blues uke. And here is a picture of all the performers. 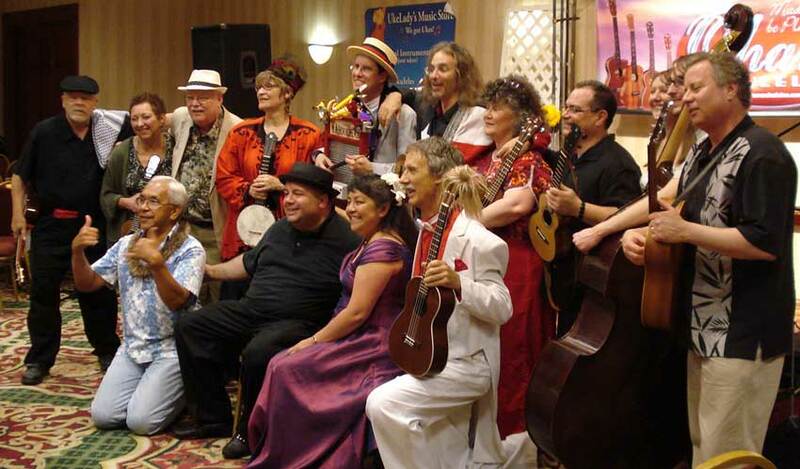 I don’t have everyone’s name here, but among this group are Pops, Michelle Kiba, Kimo Hussey, all 3 members of 4 Strings of Swing, the 3 Wahooligans, Ukulele Bartt, Gerald Ross, and Ukulele Mike and his wife and fellow performer Collene. This entry was posted in Uncategorized on April 16, 2011 by Austin Ukulele Society.